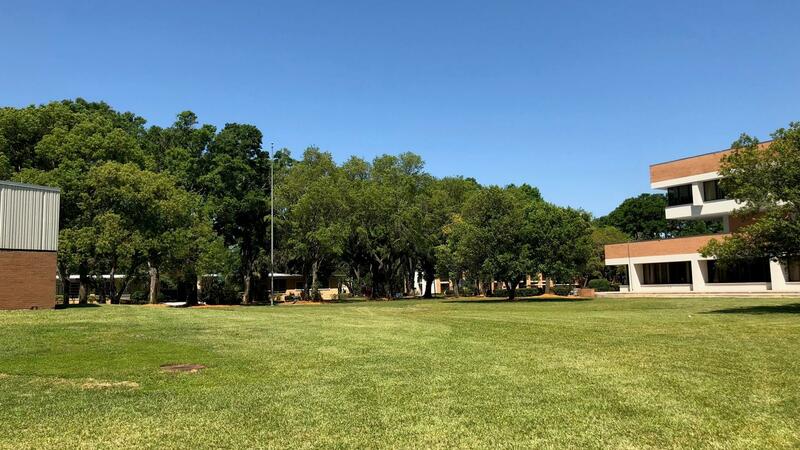 Jacksonville University’s proposed Welcome Center is part of the “Jacksonville University Project” that will be funded by a $125 million bond issue. 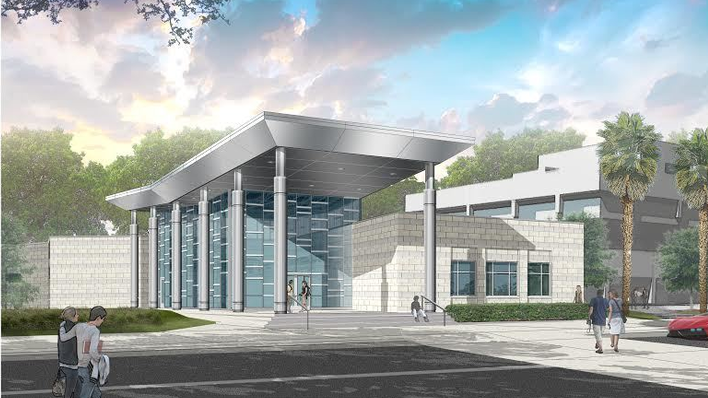 The $4 million, 12,000-square-foot Welcome Center is planned between the J. Arthur Howard Administration Building (right) and the J. Henry Gooding Building at the Arlington campus at 2800 University Blvd. N.
A hearing is scheduled at noon Wednesday by the Higher Educational Facilities Financial Authority to consider adoption of a resolution that authorizes issuance of the bonds, according to our Daily Record news partner. The authority would issue Educational Facilities Revenue Bonds not to exceed $125 million. “This bond issuance is a customary way higher education and health care organizations fund this type of ‘next step’ growth,” said Margaret Dees, senior vice president of enrollment and communications. 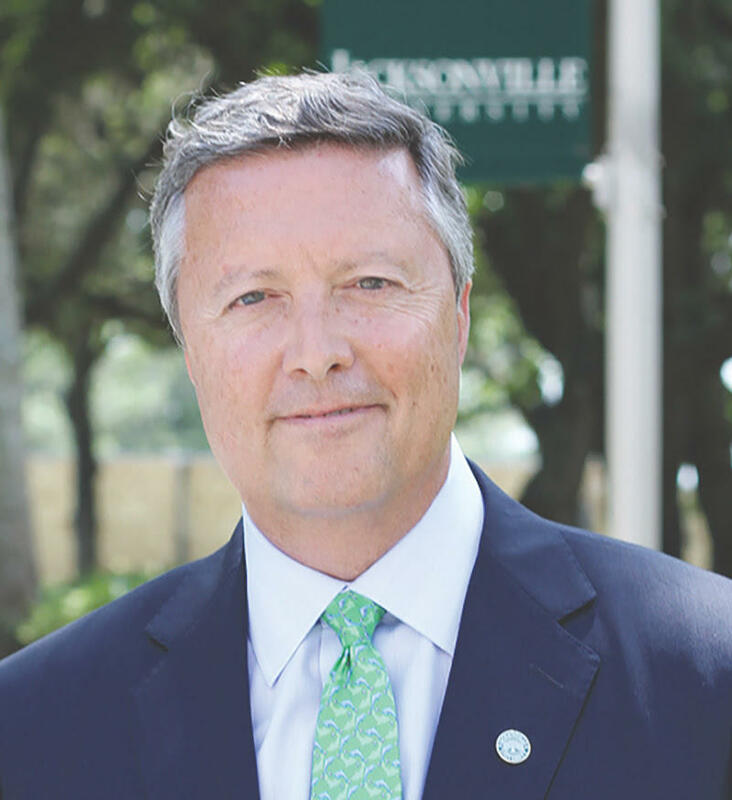 JU President Tim Cost took the helm in 2013. “These investments are designed to strategically position us today for the next 10 years to meet the needs of growing enrollment and higher demand programs,” Dees said. Financing, reimbursing or refinancing part of the costs to buy, build, renovate and equip the costs of the project; refinancing part of some outstanding debt; paying capitalized interest on the bonds; funding debt service reserves for the bonds, if any; and paying all or part of the costs of issuing the bonds. • Construction of the previously reported 104,000-square-foot building for the Brooks Rehabilitation College of Healthcare Sciences, including the Keigwin School of Nursing, the School of Applied Health Sciences and the School of Orthodontics. • Renovation of existing residence halls. • Construction of a welcome center. • Construction and renovation of capital improvements. • Installation of facilities, furnishings, fixtures and equipment for those projects. 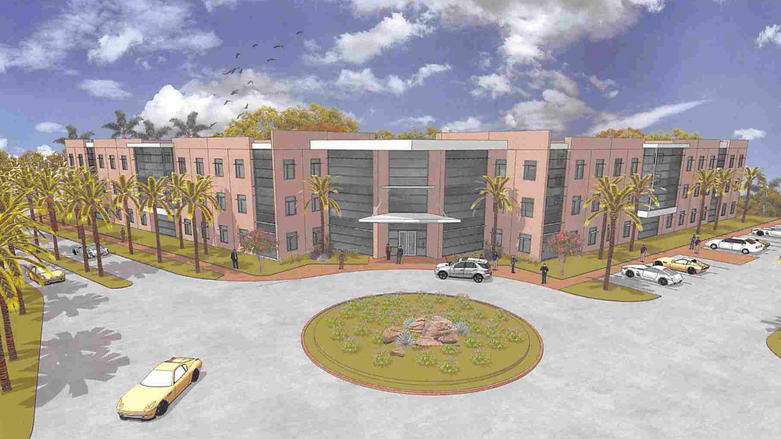 Last week, JU applied to the city to build the proposed $4 million welcome center at its 2800 University Blvd. N. riverfront campus. Plans show the 12,000-square-foot, single-story welcome center between the J. Arthur Howard Administration and J. Henry Gooding buildings. Dees said completion is expected in early 2019. The permit application lists The Haskell Co. as the contractor and architect for the $3 million construction project. Prosser Inc. is the civil engineer. The center is one of the elements comprising the “Jacksonville University Project” that would be financed by the bonds under consideration. The Wednesday hearing is scheduled at the Offices of the Independent Colleges and Universities of Florida in Tallahassee, at the JU Howard Building and by teleconference. The public notice also explains that the refunding obligations include a $63 million promissory note issued by JU in 2011 that refunded authority bonds issued in 2006. Those bonds financed the 500-bed residence hall and parking facilities that included demolition of Merrill and Grether Halls. 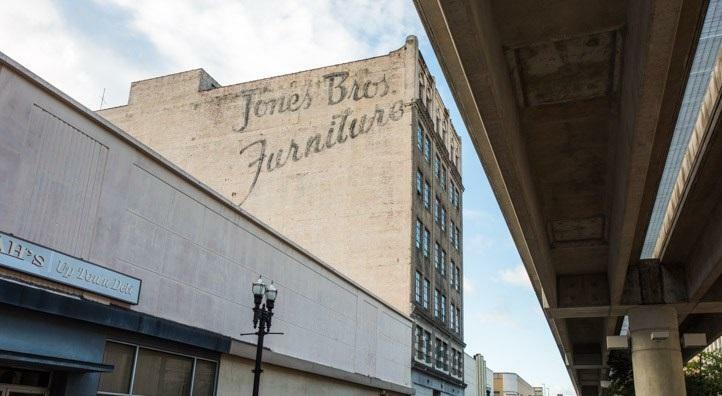 They also refinanced indebtedness that includes a 1998 promissory note issued by JU that secured City of Jacksonville revenue bonds that financed or refinanced extensive work around the campus. Refunded obligations include a 2016 promissory note of $6.3 million to finance renovation of the Williams Hall and part of a maximum $15 million line of credit revenue note by JU that financed a chiller plant and related facilities. Issuing the bonds is subject to conditions. The bonds do not constitute a debt or liability to the authority, state or city. Concurrently, the city will issue revenue bonds whose principal will not exceed $50 million for financing, reimbursing or refinancing part of the costs of the project. Ordinance 2018-227 authorizes the issuance of up to $50 million in tax-exempt Higher Educational Facilities Revenue Bonds on behalf of JU to finance capital improvements and refinance previous bonds. The bill authorizes a negotiated sale of the bonds to a chosen underwriter. A City Council vote is expected Tuesday. JU, as the beneficiary, will assume all cost and repayment obligations. JU, an 84-year-old institution, is transforming its 260-acre campus under the Cost’s leadership. North of the campus, JU is working with the developer of the 55-acre Dolphin Pointe Landing, owned by a JU graduate. That’s where the medical development, including a 120-suite skilled nursing center, is taking place. “We are educational partners with the developers in the clinical and community opportunities presented to our students as a result of the development,” Dees said. Fall 2017 enrollment was 4,222. 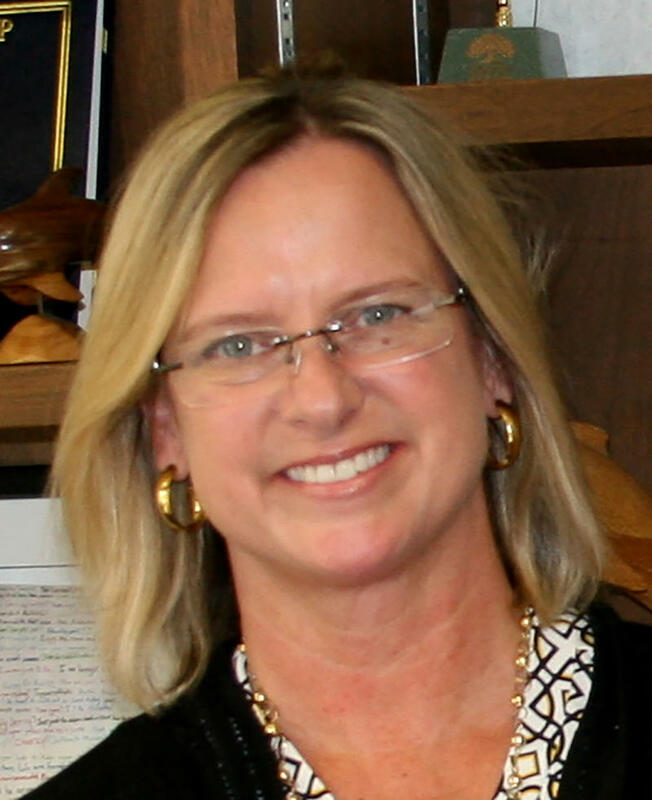 Cost led the university’s Aspire campaign with a goal of $120 million. The ju.edu/support/aspire site shows that more than $115.3 million has been raised. Dees said the bond issue and the Aspire campaign are independent but complementary sources of funding “for the encouraging prospects at the university,” Dees said. Jacksonville University’s past president and Chancellor Emeritus Frances Bartlett Kinne turned 99 Monday. Duval County Public Schools will use Jacksonville University speech-pathology students as instructors at the dyslexic-focused GRASP Academy. The School Board voted in favor of the partnership Monday night. Superintendent Nikolai Vitti says JU will provide a full-time pathologist at GRASP along with several student interns.